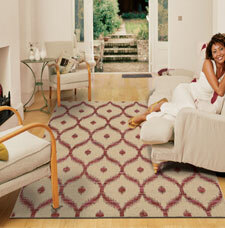 Spectrum is a collection of tribal handmade wool blend rugs. The rugs are heavyweight and feature an abrash effect, which appears as horizontal lines across the entire width. This effect occurs as a result in variations in dyes used during the construction of the rugs, which mimics how actual original tribal rugs were made. The Spectrum collection gives a sense of originality and innovative styling that has a soft feel underfoot. Fabric: 54% Rayon 45% Wool 1% Nylon.